All members of the club are expected to abide by the established safety rules and regulations while at the field. Please download at review the AMA Safety Rules. Spectators are welcome at the field to observe flight operations and learn about our hobby. Please understand that our models are not toys, and cost from several hundred dollars to several thousand dollars. If you bring children to the field please keep them by your side. You are responsible for any damage you or your children may cause to the airplanes on the field. Please oberserve the NO FLY ZONE! (See map below). Deliberate flying over "the pits" is prohibited. Each transmitter must display frequency pin (see below). Taxiing is not allowed in the pit area. It is strongly recommended that members do not fly alone. Children should not be permitted beyond the spectator area unless under the direct supervision of an adult or designated Club flight instructor. Helicopter flights are only allowed in designated areas at the north end of the field. Sailplane high start lines are to run parallel to active runway. Direction of take-off and landing is to be determined by the wind direction. All flight operations must stop during lightning/electrical storms. Models will fly only in predesignated areas and will yield right-of-way to full-size aircraft. All model aircraft should stay below 400 feet above ground level. If you damage another members model, equipment or other property, due to carelessness, negligence or failing to adhere to club rules, you will be financial responsible for repairing or replacing the damaged model(s), equipment or property. If you fly at our field, you MUST have a proper Frequency Pin on your person or radio. This is a critical safety rule and there can be NO EXCEPTIONS! Available frequency pins can be found on the inside of the Club shed door. Please place your AMA Card in the appropriate frequency slot and take the pin with you. Be sure to return the pin and take your card when you are finished flying. If you are found flying without the appropriate frequency pin, you will be fined $1.00. The "Honor Box" is in the shed. Continued violations of the Frequency Pin Rule may result in your flying privileges being suspended. Note: We have neighbors!!! The areas to the north & northeast of our runway are designated a NO FLY Zones. The map below shows an aerial view of this area. Please observe this no fly zone and remind anyone you see flying in that area to move away from that flight path immediately. Please do not fly over the property of our neighbor to the North. 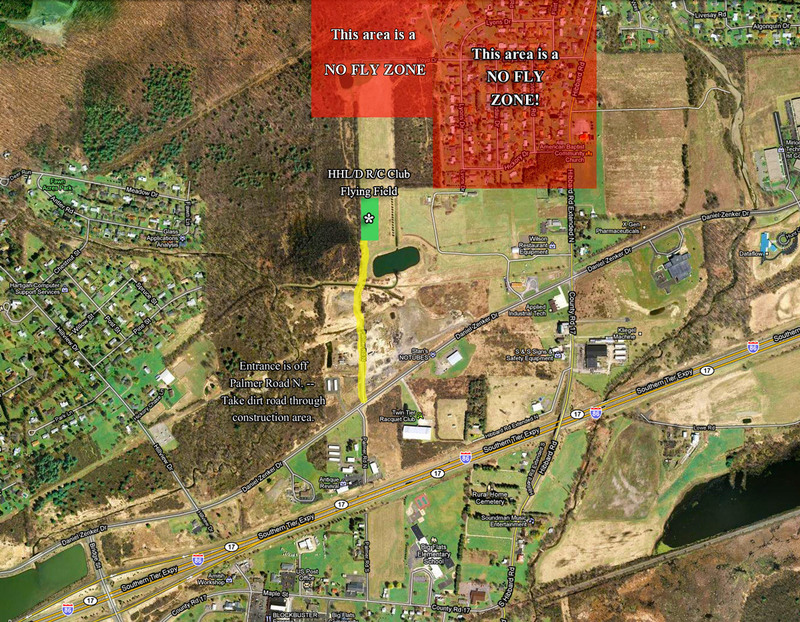 A more detailed view of our No-Fly Zones can be found here. © Harris Hill Lift/Drag - All Rights Reserved.